OCEANSIDE, Calif. /California Newswire/ — Event Media, Inc. announced today that the third annual Bike The Coast – Taste The Coast, the unique cycling event, food festival and sports expo in Oceanside, is pleased to introduce Tri-City Medical Center as its presenting sponsor. The event, set for Saturday, Nov. 3, will be known as Bike the Coast – Taste the Coast presented by Tri-City Medical Center. "We are delighted to join forces with Tri-City Medical Center of Oceanside for this wonderful community event," said event organizer Jim Curl of Event Media, Inc. "For more than 50 years, Tri-City Medical Center has capably served the healthcare needs of North County residents. Meanwhile, in its brief history, Bike the Coast – Taste the Coast has created a niche and been embraced by the local cycling community." 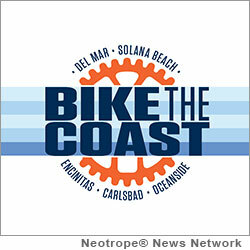 As in previous years, the 2012 event will feature a choice of five cycling routes followed by the Taste the Coast festival, including tasty local cuisine, charity beer garden, and a sports and fitness expo (featuring the Tri-City Medical Center health tent) at the Oceanside Pier. "Tri-City Medical Center is committed to improving the health and wellness of our community and Bike the Coast – Taste the Coast is a good example of the type of event that promotes that goal," said Larry B. Anderson, CEO of Tri-City Medical Center. Tri-City Medical Center is a Gold Seal-approved, full-service, acute-care hospital with two advanced clinical institutes and physicians practicing in 60 specialties. The hospital, a leader in robotics and minimally invasive technologies, has served the community for more than a half-century. It is administered by the Tri-City Healthcare District, which includes parts or all of Oceanside, Vista, Carlsbad and San Marcos. For more information about Tri-City Medical Center, please visit www.tricitymed.org. Bike the Coast – Taste the Coast is a bicycle ride followed by a Bike festival, with a choice of 7, 15, 25, 50 and 100-mile rides starting and finishing with food, beer garden, and music at the Oceanside Pier on Saturday, Nov. 3. The cycling courses include the San Luis Rey Bike Trail and San Diego's North County beaches of Oceanside, Carlsbad, Encinitas, Solana Beach and Del Mar. Proceeds from the ride support the San Diego County Bicycle Coalition – www.sdcbc.org — a 501(c)3 non-profit organization dedicated to making bicycling better in greater San Diego. The ride is supported locally by the Oceanside Bicycle Committee. For more information including course maps, event schedule and registration, visit: www.bike-the-coast.com. For Oceanside travel information, www.VisitOceanside.org or call 760-721-1101.